Hello lovely people, BBC1 here! This dish brings back fond memories for me. It came about from one of those late nights clubbing with friends and being ravenous when you get home, only to find that all you have a is couple of ingredients in the fridge/larder! I was reminded of it last week when speaking to an old school friend, Elaine, on Facebook. The conversation turned to food, as it invariably does with me, and we discussed vegetarian food, so I promised to post this on the blog for her to try! Hope you and your daughter enjoy this Elaine! In a large pan melt the butter with the rosemary and nutmeg on a medium heat. Next add the washed and drained leeks and sauté for about 8 to 10 minutes, stirring to ensure they are covered in the melted herby butter. Then turn the heat to high and add the cup of dissolved stock cube water. Let this come to a rapid boil then turn the heat back to medium and add the diced pepper. I leave these sitting on top of leeks and do not stir them in, so they “steam”. In the meantime cook the pasta according to packet directions – I undercook the pasta by about one minute so it can carry on cooking for a minute or two when added to the sauce. Takes between 10 & 15 mins depending on the brand used. After the leeks and pepper have sweated and steamed in the stock for about 5 to 10 minutes (depends how crunchy you like your veg) add the mushrooms and peas. Again, I just let these sit on top and steam for 10 minutes. When happy that veg is cooked to your taste add the cup of cream and the Parmesan cheese and stir. Drain the cooked pasta and add to sauce, stirring to ensure it is fully coated. You can add more cream and Parmesan at this point if you like. Season with salt and pepper to taste and leave to cook gently until the pasta is cooked to your taste. We serve this with a generous amount of grated cheddar cheese on top and thick slices of BBC2’s homemade whole wheat bread. Scrumptious! It just goes to show what you can make from what you can find in the fridge/larder when your drunk and starving lol. I have also put asparagus into this when it is in season. But you can put whatever veggies you like in – please let us know what you would/do put in? 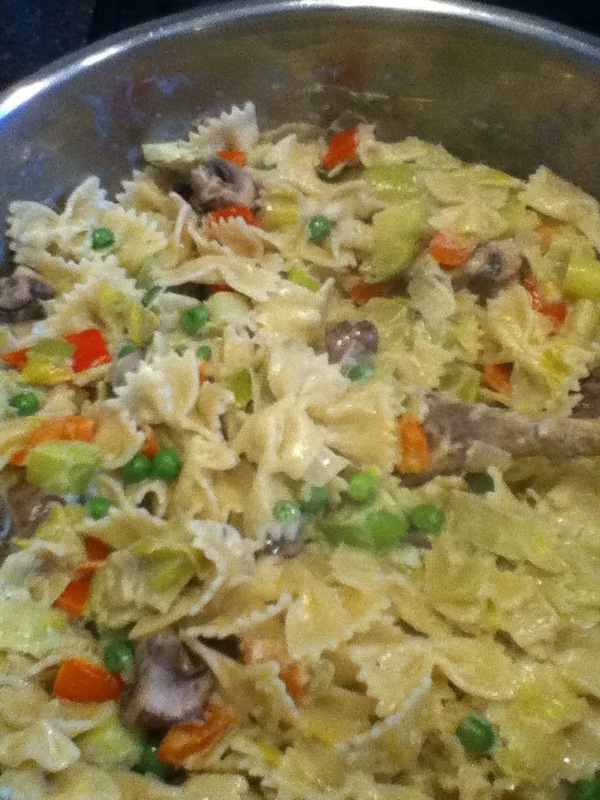 Tags: bell pepper, cream, herbs, leeks, lunch, mushroom, nutmeg, Pasta, peas, peppers, rosemary, vegetable stock. Bookmark the permalink. Yep, you were right, this recipe sounds so lovely that I now want pasta and it’s only breakfast time! Glad you like it. Is 11pm here and all I keep thinking about is your pasta dish! Oh well tomorrow…lol!